He always arrived in a rumpled brown suit and a wide, striped 1970s-style tie. He would bustle in the door of our apartment in Germany, run his stubby fingers through his mop of gray hair, say “guten Abend,” and sit down in the chair beside the piano bench. And I duly took my place beside him on the bench. I had one piano book when I studied under Herr Mueller. Not a book for scales or a separate book to write in and draw the little notes on the staff and practice making the G-clef. I was way more advanced than that. I’d been taking piano since I could remember. So when we arrived in Bonn, Germany, in my freshman year of high school, my parents set about finding a piano teacher. And they found Herr Mueller. I wish I knew his whole story. He had been the pianist for the some big orchestra in the United States. Thus, in his younger days, he had played in large concert halls to crowds of appreciative symphony goers. I’m sure he’d worn a tux and, when he approached the piano bench, had deftly tossed the tails behind him. He had been applauded. And now, he sat beside a high school girl who didn’t appreciate that she was learning piano from a genius. I ache to think of it. We practiced from this one book–a big red book filled with music from the great composers. The cover and spine and title page are all missing, so I can’t even give the title. 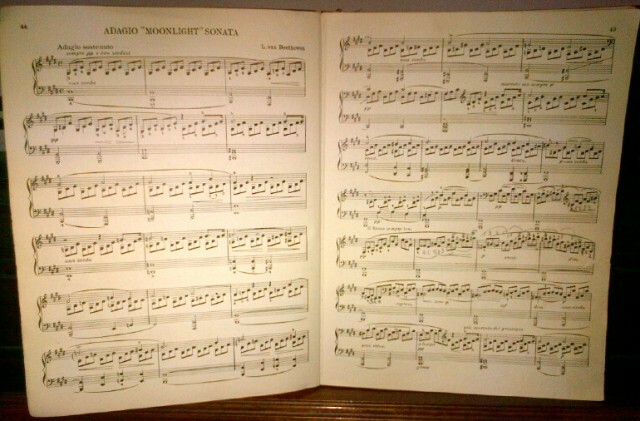 But when I sit down at the piano thirty years later and open the book to page 44, I can still play Beethoven’s “Adagio ‘Moonlight’ Sonata.” I can still play parts of “Fur Elise” (page 48) from memory. When we opened to a new song that came from an opera, Herr Muller told me the story and where, in the opera, this song appeared. He told me how to play Edward Grieg’s, “Anitra’s Dance” (from Peer Gynt) based on the action at that point in the story, and he could hum every melody from the entire opera. I think of those days now. 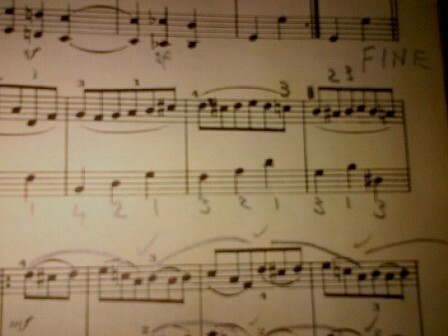 I remember how I’d hold my breath when he leaned in close to scribble on the piano page and his bad breath floated into my nostrils. I remember how his stubby fingers flew across the keys. I remember how he loved, loved, loved the piano. If I could just take lessons from him now. These thirty years later I would cherish every word. I’d have a notebook beside me where I would write down the context of every melody he assigned just as he told it to me. And I’d just offer him a breath mint and be done with it. I worked hard for him. I practiced hard. I loved the piano too, for a time, even accompanying my high school chorus for a few programs. Herr Mueller, I wish I could thank you. I’m sure you’re long gone from this world, but I thank you for your love of the piano and great music. I’m sure that some of my love for great literature comes from hearing Herr Muller tell me the great stories of the operas with unmatched passion. And the fact that I could accompany my high school chorus as they sang Bob Dylan’s, “The Times They Are A-Changin’,” was because I had pounded away at Bach and Verdi and Grieg and Tschaikowsky and Wagner. The same is true for writers. We’re readers first for good reason. We read great literature (past and present) because it helps us with our craft. We read because we love love love the words on the pages–and we’re amazed when, like the music notes floating on the staffs, the words come together in a way that gives us goosebumps. We want to learn to make that happen in our own writing. We’re creating a melody in our manuscripts. I wish I had appreciated the privilege of studying under Herr Mueller. Likewise, I wish I had appreciated the time I spent reading the classics in my literature classes both in high school and college (this summer I’m rereading many of those classics that any self-respecting English major should be conversant about!). Because now, I understand. Now I appreciate them. 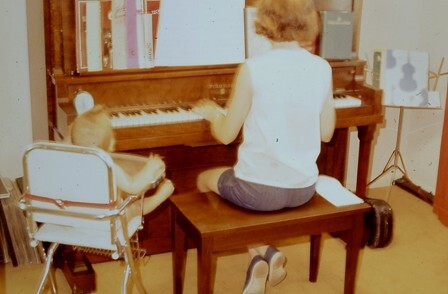 Me at the piano with appreciative baby sister as my audience (ca. 1970).